Powers/Abilities: Nightfire could initially only project bursts of flame. Later, he could form semi-solid, defined objects under his control out of fire or earth. He may also have enhanced physical abilities, as he proved able to grapple with the demon Baphomet. (Son of Satan#1 (fb)-BTS) - Since his birth, the young brave was believed to be a special one with a great destiny, at least by the elder shaman of his tribe. The shaman nurtured his spirit throughout his life. (Son of Satan#3 (fb)) - During the course of his training, the brave and the shaman were confronted by the Possessor, who demanded mystical training. The shaman, seeing the evil in him, refused to train the Possessor. He then told the shaman to teach the brave everything he knew, so that he could one day seize the knowledge from him instead. (Son of Satan#1) - The young brave was on his seventh day of fasting, under the tutelage of the elder shaman to attain his Visionquest. The Possessor appeared and slew the elder shaman. The young brave partially awoke from his induced mindsleep and, believing that the Possessor was to be his spiritual guide, vowed to follow his commands. BTS - The Possessor used his psychic and magical powers to awaken the power of the young brave, transforming him into Nightfire. The Possessor similarly empowered (to a lesser degree) and took control of Nightfire's tribe. He then brought them to a cave containing the local portal to Hell. (SoS#2) - Under the control of the Possessor, Nightfire attacked a pair of police officers who investigated their activities in the cave. When the Son of Satan arrived in pursuit of the Possessor, Nightfire and his tribesmen prepared to attack him. However, the Possessor took control of Hellstrom as well. (SoS#3) - Nightfire and his tribesmen followed the Possessor's lead in attacking Baphomet and the other demons who defended the gate to Hell. Nightfire himself attacked Baphomet, taking his greatest attacks and fighting back with his own. 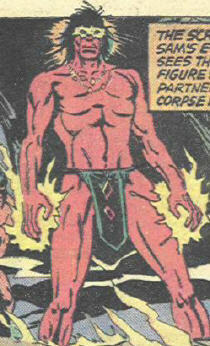 In the course of the struggle, Nightfire grabbed Hellstrom's trident to use as a weapon. 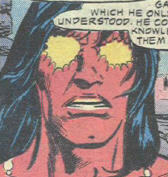 However, the psychic backlash (caused by the conflicts among: (1) The Possessor's link to Hellstrom, (2) The Possessor's link to Nightfire, and (3) Nightfire's link to Hellstrom via the trident) allowed Nightfire to regain his own mind, and access his full power. Forming weapons from rock and flame, Nightfire battered the goat-demon into submission. Later, after the Possessor had been defeated, Nightfire took his inert form under his wing, hoping to heal his psychic and emotional scars, and to further develop his own spirit in the future. Comments: Created by John Warner and Sonny Trinidad. Hey, ever read the Son of Satan? If so, then you and I were the only two! Anyway, Nightfire seemed to have great potential as a mystic, but he hasn't been seen in over 25 years, and an appearance isn't seeming any more likely! A Navaho, he saw great potential in the young brave and cultivated his spirit throughout his life. He refused to share his knowledge with the Possessor, because he could see his evil intent. Some time later, he guided the young brave on his visionquest, but the Possessor returned suddenly and slew him.